As soon as I saw the artwork on this album, I knew I was in love. 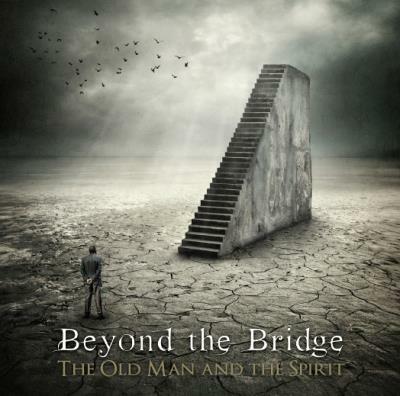 Beyond the Bridge‘s debut album “The Old Man and the Spirit” blew me away from my very first listen, and it continues to do so. This album is so complete: It takes influence from prog metal, symphonic prog, and many other sources. Genesis, Dream Theater, and others seem to be present. Yet, the lyrical content is what intrigues me so much. The story centers around the conversation between the old man and a spirit, who are played respectively by singers Herbie and Dilenya. This conversation plays out in an awesome way, and I can’t wait to share it with you. “The Old Man and the Spirit” presents us with two characters. The Old Man represents human sensuousness: He has seen and experienced every feeling and vice. The Spirit, on the other hand, represents human wisdom and awareness. She knows everything and knows the meaning of life. These two could not be further apart in what they value and what their perspectives are. Now that the foundation is set, the album begins with an amazing song called “The Call”. The Old Man here is calling for help. He has felt everything in his shady past, but he doesn’t have understanding. He doesn’t know. He can’t yet see. “I wish my life would disappear/ Or merge within a dream/ No questions, suffering or fear/ A clear, indifferent stream/ I wish my light would cease to burn/ But yet, my soul is torn/And lets me face my last concern/Why I was even born”. The Old Man has felt everything, but has nothing. He wants to know the secrets of life. He wants to know whom he is. He wants to know why he is even alive. Scary, I know; but this is something that every human being should be asking themselves. Why am I here? “How can a single drop perceive/ the whole surrounding sea?” This astounding next track from Beyond the Bridge’s “The Old Man and the Spirit” begins with the end of the Old Man’s call to know; to understand and see. Behold, the Spirit appears in a swirl of light to answer his call for understanding. Astonished, he asks her for knowledge of the beginning of time. He asks for the blinders to be removed. He wants to know what he really is. Yet, she won’t respond. She has a vendetta to fill of her own, and she won’t give in to his request so easily. She offers a deal: She will give him his desire if he will give her the ability to feel. He must abandon himself in order to get the knowledge he desires. She, in essence, demands that he become something less than human! She tells him that awareness is impossible in his current state, and he must give her his humanity. However, she has other ambitions here, too. “All doubts dissolved/ Opaque turned clear/ No questions, suffering or fear/ No blemish but inﬁnity/ Conﬁned to my reality”. At first glance, this third track is nothing more than an instrumental interlude in the story. However, there is much to this track. The triumph of irreality refers to a state of mind when the Old Man and the Spirit join together. This is impossible (reality) so this song points to this impossibility of joining the Old Man and the Spirit; the farce of joining complete understanding with the human experience. These two forces are polar opposites: A mind must choose one or the other. This is the first hint we get that this story may be far more cerebral and introspective than at first glance. This track also offers dialogue that reveals something startling: The Spirit was once a human. This is a foreshadowing of what is to come and the mysteries that will be revealed. We are essentially dealing with a human on one hand, and someone that chose understanding at some point in her existence. We’ve learned that the Spirit’s state of being is pure knowledge, logic, and wisdom. Now, we come to “The Spring of It All”. This track stuns me every time, not just with the amazing vox, but also with the amazing lyrics. In this track, the Spirit continues to convince the Old Man that he is confined and unable to seek awareness. She asserts that Man is finite and cannot possibly understand or find the “spring of it all”, the beginning of all things. The Old Man agrees with her, for sure; but he sees majesty in this world, too, though it may give more questions than answers. Infinite knowledge should not render this reality as worthless. “When the sky is gleaming/ Rivers streaming/ It’s a reason to wonder”. This world is a masterpiece to behold; yet, man can never know it all. I find an interesting dichotomy here: The Old Man has the ability to see the world and be struck with awe and wonder over it. It pulls at his heartstrings to see it. Yet, he is caged and unable to know it perfectly, and he will never know the things he cannot see. On the other hand, the Spirit has all the knowledge and logic and knows all the inner workings of the universe, but she cannot feel or experience it personally. She cannot wonder or be in awe over it. She simply knows. That’s all. Track 5 off of “The Old Man and the Spirit” is one of my personal favorites. Here the Spirit continues to woo and convince the Old Man of his shackles. She tells him of the vast, untapped power all around him, even in the smallest raindrop. “Every raindrop is telling stories”. There is power he cannot see or fathom, and she wants to give this to him. The Old Man is surrounded by wonders that he cannot comprehend without the Spirit’s help. It’s almost as if the world is one big tease. It’s almost as if the Old Man here is Descartes, and finally realizes that his senses are flawed, finite, and fraudulent. What can man do to uncover truth? In the next part of the story, however, the Old Man strikes back at the Spirit. “How can a single drop perceive/ The whole surrounding sea?” This is such a simple phrase, yet it is packed with meaning. In this the sixth track on Beyond the Bridge’s “The Old Man and the Spirit”, the Old Man begins to demand answers. His nature is to be curious and to desire the secrets of the universe, so he is seduced mildly into possibly accepting the Spirit’s offer. This is the demand of his primal nature: to know. How could he, a mere man, ever perceive the entirety of the universe? He has lived a life that now feels meaningless and empty, and now he simply wonders about all that he once ignored. Without the Spirit’s help, he will never receive the enlightenment he now seeks. Should he? Should he give in to this primal demand? “Doorway to Salvation” presents the Old Man as he begins to respond to the Spirit’s mental wooing. She wants him to give up his ability to feel, his memory, and his emotions. The Old Man considers this offer momentarily, but then responds “A child/ A dream/ A womenʼs embrace/ A thought/ A scream/ A comforting face”. The Old Man realizes the weight of what the Spirit is asking. She is asking him to give up everything near and dear to him. Indeed, she is asking him to give up the ability to hold anything dear at all!!! For what? What would he gain? Knowledge of the mysteries of the universe? He would lose everything—his faults, his weaknesses, his strengths, his fears, and on and on—would all be gone for all time. He is being asked to give up the very things that make him human, that provide some sort of consolation in this life, and that connect humanity. “Beauty and bliss/ In the grace of a kiss/ And love/ Lie in the transience of life”. The battle begins to get very intense in this eighth track. A sparring of words occurs as the Old Man and the Spirit hurl words at each other to counteract each other’s ideas. The Old Man is beginning to see what he’ll miss. He’ll miss the feelings and emotions that make a human life worth living. Furthermore, he’ll miss the experiences of life that facts and knowledge will never be able to surmount. He will miss the journey! He will miss the wonder and beauty that only man can appreciate, and that infinite knowledge would tarnish and belittle. The human experience itself is on the line, and the Spirit is gently trying to pry this treasure from the Old Man. However, the Spirit is about to turn up the intensity even more. As we near the end of the album, the Old Man seems to be making up his mind. “My heart is a ponderer/ My soul is a wanderer/ To touch, to be/ To feel, to see/ The edge of the knife/ The difference is human/ Is life”. He realizes the fraud that the Spirit is perpetrating. He sees the true value of the human frame: emotions, intellect, mind, soul, spirit, body. The Spirit continues to remind him of the vast amount of knowledge that he will never have, but he doesn’t care anymore!!! He’s learnt his lesson: He has learned to appreciate himself, his memories, and humanity. He has learned to appreciate the beautiful tragedy that is life . At the very end of this track, we find out why he was depressed enough to give the call for awareness in the first place: “All my memory of joy is her/ All my memory of sense is her/ All my memory of life is her/ So I’m wondering/ How could I trade/ Whom I love…?” He’s been pining for the love of his lady. She is gone now, and he in turn has started questioning everything he ever knew or felt. Why would she leave? Why does he feel this way? Can he unload this burden of emotions? “I am the word/ I am the deed/ I am the heart/ Thank God, Iʼm a Man.” One of the prog community’s collective favorites off this album, this ballad is where the Old Man not only makes up his mind, but relishes and glories in his ability to feel. He relays the sad memory of the day his love left him; that fateful day. But he remains hopeful above all else, and he sees that is what is important in this life. When he relives this day, he suddenly realizes the depth of his emotions. He sees the aspects of himself that make him a man. He also sees the amazing ability to love that men are endowed with, and he sees that the point of life is love itself! Why should he give up the meaning of life in order to know something? The Spirit was wrong: He had reached awareness on his own! In this truly grand finale to “The Old Man and the Spirit”, the Spirit is completely silent now. The Old Man claims the day, “Iʼm so grateful I/ Fell and rose and tried/Won and laughed and cried/Lost and swore and lied/Now I have to conﬁde:/I loved/I lived.” The Old Man was truly aware now. He sees that love is the ultimate meaning of life. He also sees that his human experiences are what compose his essence, and those memories are very real. They are what make him, well, him! He may have, in weakness, called out for this life to end. He may have wanted to abandon that sick feeling in his heart and stomach. However, that same weakness is now his glory. He is not ashamed of his sins and weaknesses because they make him human. And if he is human, he can love. His journey means something. And, so, we reach the end of the great struggle. The Old Man calls out to release the pain in his heart, and the Spirit takes advantage of that moment of weakness. She wants the human experience, and so tries to play it down so that the Old Man will give it to her. What she didn’t realize was that the Old Man had unimaginably deep feelings that she was about to tap. His lost love brought him the very awareness that he sought: He didn’t need the Spirit to show him the meaning of life. He had rediscovered LOVE as the meaning of LIFE. There is part of me that thinks that the Spirit was not hostile here: She knew he would find this awareness if she tried to take away his humanity. Possibly, this was her plan the whole time, or at least, I like to think so. Part of me also likes to think that the Spirit is herself the Old Man’s lost love. There is nothing in this album to suggest this other than the fact that the Spirit’s words in “Triumph of Irreality” are spoken by another woman’s voice. I like to think that, like I said, she was helping him reach awareness on purpose, as if she had a little ability to love him still. She knew him well enough to know that pointing him back to his feelings would wake him from his slumber. Anyways, the Old Man finally sees love as the ultimate meaning in life. I partially agree with this conclusion, for I believe we are here to love. However, I think we are here to love because Jesus Christ loved us first. This completes the cycle that Beyond the Bridge started because it provides foundation and meaning for love in the first place. Peter Degenfeld, the writer for Beyond the Bridge, once said that this album’s concept originated from a sense of loss and monotony after earning a physics degree. He said he had learned so much about the world’s mechanism that it had now lost its beauty and wonder. He had lost the feelings associated with the human experience of this world! In the end, this album asks us to make a choice: Will you follow the Old Man and his ability to love and feel and wonder, or will you follow the Spirit and her knowledge, statistics, and coldness? Peter made his decision (he got into music, obviously), and I think every one of us have or will have to make the same decision. Will technicalities rule our lives, or will we love life for what it is? Think about it.